I don’t remember exactly where I read it, but I got a tip from a bird-related article that advised setting out grape jelly (or jam perhaps) in early April so that migrating Orioles will recognize and learn where to come back for the food. 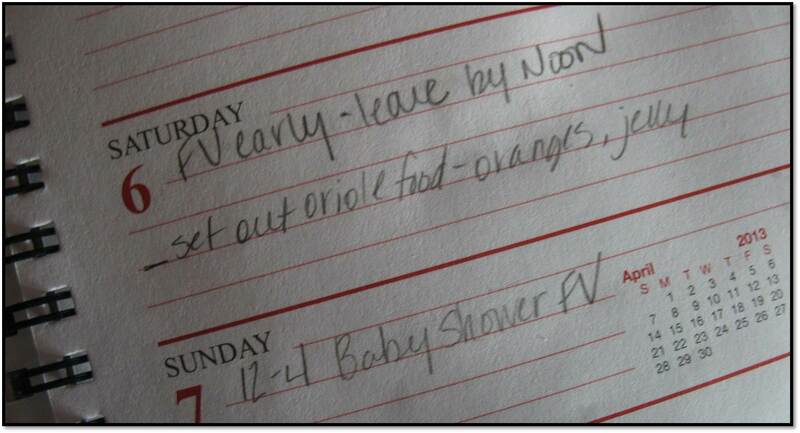 Dutifully, I made a note to myself to get jelly and have it set out in early April so it would rain down Orioles in our yard. I even bought an orange-colored dish for good measure, as I read they are attracted to the color. We here at the Seed n’ Feed aim to please. Days and weeks had come and gone without Orioles. Andrea had some explaining to do. All the grape jelly seemed to summons was rain, a lot of rain. I know, April showers and all, but still, it was aggravating to put out fresh dishes of jelly only to be left with purple water hours later. And no Orioles. Shortly after 7:00 this morning, something black and orange and awesome suddenly materialized on the deck. My Oriole wish was being granted. I don’t know if it was persistence in displaying the purple water, the addition of the hummingbird feeder, or this woman’s sheer will to lure in an Oriole, but whatever it was finally worked. I feel like I’ve triple-dipped today from the bowl of birdie delights. 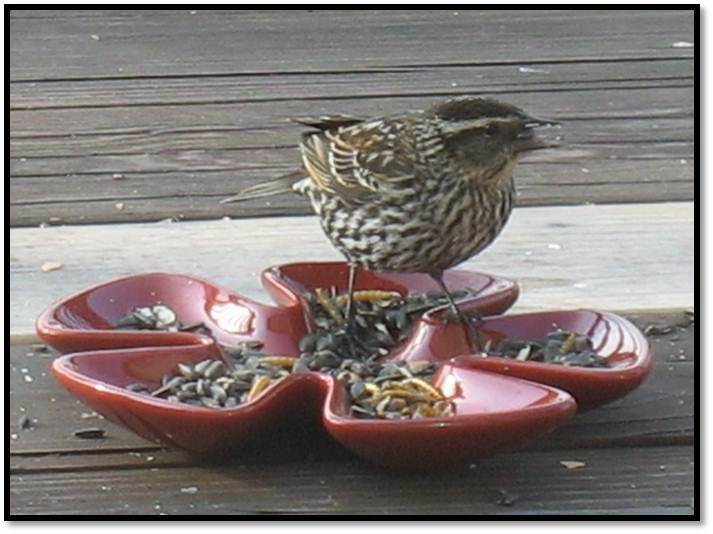 The female Red-winged Blackbird pictured below is not a new customer, but since she was really showboating on that tray of seeds when I was snapping the other pictures, I am giving her a guest appearance in this post. I can take a hint! 1. Since finishing the last of the store-bought red hummingbird nectar, I am making my own using Audubon’s simple recipe (without dye). 2. 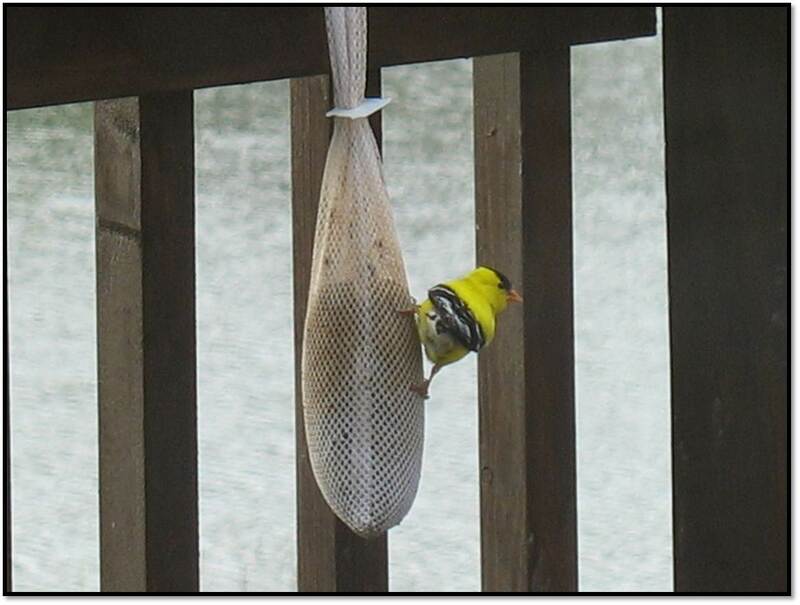 When I put a little suet on the deck floor to help feed the local one-legged European Starling, more Orioles appeared that ate both the suet and the grape jelly. 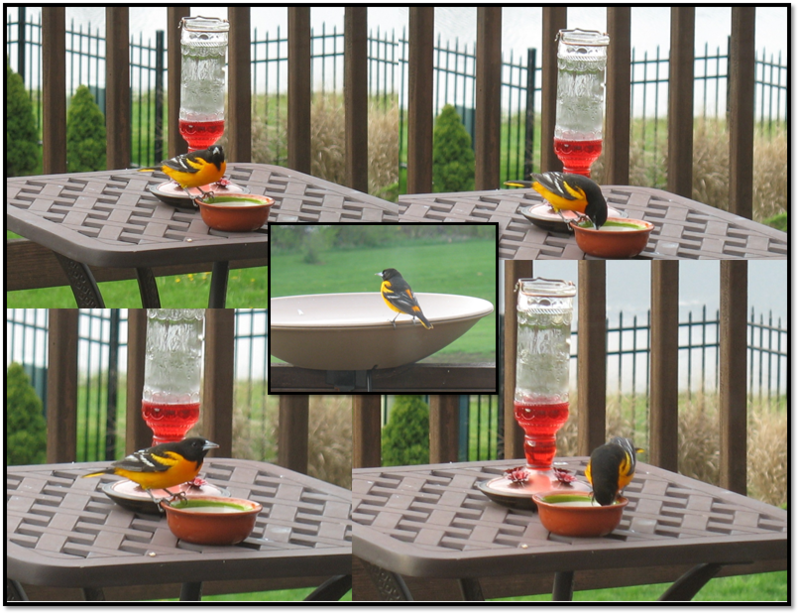 Lady oriole on the cup of grape jelly on the left, two males sharing suet on the right. 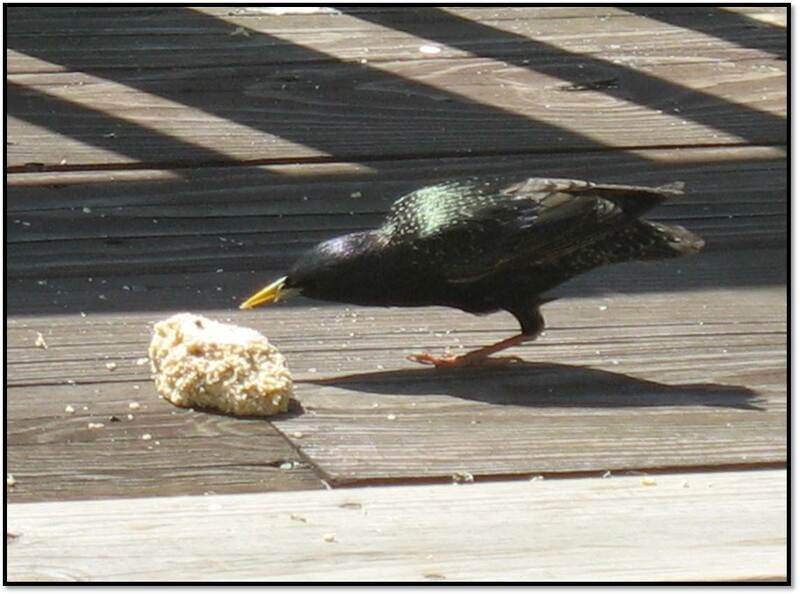 Here is that one-legged starling that has been visiting us regularly since winter. I’m pretty sure I got busted here snapping photos by the lady Oriole.